Is this the face of a smiling monkey? 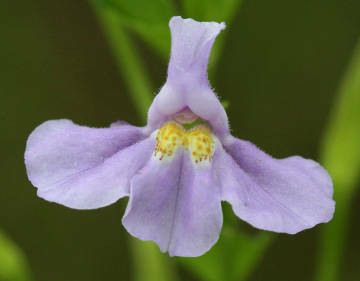 People who thought so gave this lovely wetland wildflower the name square-stemmed monkey-flower. Thanks to the wet weather we’ve had this summer, it’s a good year to find a native wildflower of wet areas that has showy, light blue blossoms and an odd name: square-stemmed monkey-flower. Square-stemmed monkey-flower (Mimulus ringens), also called or Allegheny monkey-flower, grows in places where the soil is always wet. Look for it at the edges of ponds, streams, swamps, and ditches, and in wet meadows. In these areas you might find an occasional plant or a large stand of plants. The banks of the Assabet River can be a good place to look. Its need for wet soil may explain why we typically don’t see square-stemmed monkey-flower more often that we do. In many years, the places that are wet this year dry out during the summer. The plant grows to 1 to 3 feet on a square stem. Its light blue or lavender blossoms are fairly large, about an inch across. Its narrow lance-shaped leaves grow opposite one another. The name monkey-flower comes to us from the days when people spent a lot more time than we do looking at things in nature and letting their imaginations run. Recapture the fun of those days by telling some kids about the flower and letting them help you find it on a summer walk along the trails in Westborough. We don’t have monkeys in Westborough, but we do have monkey-flowers. In fact, there’s a whole troop of monkey-flowers in North America, but almost all of them are out west. The Grand Canyon, for example, has seven different kinds of monkey-flower. Even in arid areas, most grow in wet places – near a spring or seep, for example. These western monkey-flowers come in many colors, including vivid red and bright yellow. Look for them if you travel out west. Square-stemmed monkey-flower has served as a research subject in genetic studies and pollination studies. One reason is that it’s fairly easy to grow. It is pollinated by bees, including bumblebees and several kinds of small native bees. In addition to seeds, the plant also spreads by creeping rhizomes (underground stems). Like many native plants, square-stemmed monkey-flower had uses in Native American medicine. The Iroquois used it in a wash to counteract poison. They also made a medicine from its roots to treat epilepsy. Due to its water-loving habit, square-stemmed monkey-flower is suitable for rain gardens. It thrives in full sun or partial shade and blooms throughout the summer. Commercial varieties are available.